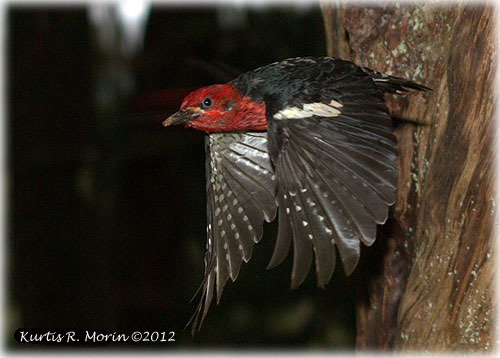 This red breasted sapsucker was photographed as it was just flying away from its nest. These wood peckers are nesting with babies in many of the old growth trees, you can see them coming and going bringing bugs to feed their young. It is interesting that each time they leave they take out the trash, so to speak, as they carry out the wastes from the nest. Ketchikan: Alaska Communities See Increase in PILT Payments - The U.S. Department of the Interior is distributing nearly $27 million to Alaskan communities in compensation for taxes that could not be levied on federal lands in their jurisdictions during fiscal year 2012. “With the federal government owning 60 percent of Alaska, the payment in lieu of taxes program ensures communities a source of funding to pay for emergency services, roads and other items that would otherwise be supported through local property taxes,” said U.S. Senator Lisa Murkowski (R-AK). This year’s PILT program is the last to be funded under the Emergency Economic Stabilization Act of 2008, which enacted a five-year authorization for funding full entitlement levels of the program. The 2013 budget proposes a one-year extension of the current PILT program, maintaining the existing formula for calculating payments to counties – considering acreage, population and prior year revenue payments. On the 3,052,122 total acres of federal lands in Ketchikan's jurisdiction, the Ketchikan Gateway Borough will be receiving $1,038,263 in compensation for taxes that could not be levied. In 2011, the Ketchikan Borough received $1,006,148. Alaska: Federal Court Allows State to Continue Preparing for Upcoming Election – Today a federal court denied a request by several Alaska Natives to temporarily halt state election officials’ preparations for the upcoming primary elections using a revised electoral map. United States District Court Judge Sharon Gleason found that the plaintiffs, who filed a lawsuit seeking to bar the state from moving forward with its elections until the revised map is approved by the United States Department of Justice, had not shown that they would suffer irreparable harm if the state prepares for the election pending the map’s approval. The lawsuit filed last week, sought to keep state election officials from implementing a redistricting plan until that plan wins U.S. Justice Department approval. Alaska: Scrapping of Polar Sea Icebreaker Halted – With the scrapping of the Polar Sea scheduled to beign within days, United States Senators Lisa Murkowski (R-AK), Mark Begich (D-AK) and Maria Cantwell (D-WA) have reached an agreement with the U.S. Coast Guard to postpone the scrapping of the Polar Sea through the end of 2012. The agreement was reached during a meeting of the Senators and the Commandant of the U.S. Coast Guard, Admiral Robert Papp, Jr. The icebreaker, based in Seattle, had been scheduled to be dry-docked and taken apart beginning Monday. This process would have ripped out the vessel’s hubs and sealed off major portions of the vessel – a key step toward final destruction of the icebreaker. Scrapping Polar Sea would leave the United States with only one operational icebreaker, the Healy, which was designed primarily as a scientific research vessel and only has medium icebreaking capability. The second heavy duty icebreaker, Polar Star, is currently in Seattle being refitted after years of receiving routine maintenance in ‘caretaker’ status. Alaska: Area M Seiners Association Stand Down During First Commercial Salmon Fishery Opening of 2012 - For the third year in a row, the Area M Seiners Association decided to voluntarily sit out the first opening of the June sockeye salmon fishery last week. The Area M fishery is located around Alaska’s Eastern Aleutian Islands and Western Peninsula on the North Pacific Ocean and Bering Sea. The Association has 35 members from Sand Point, King Cove and False Pass. DANNY TYREE: Father's Day: A Survival Guide - I'm counting on last autumn's funeral to help me put Father's Day in the proper perspective. The day after Thanksgiving our beloved 14-year-old cat Mewsilla surrendered the last of her nine lives. My wife suggested that it would be a good father-son bonding experience if Gideon (now age eight) went up the hillside with me to bury Mewsilla. Mewsilla really should have been euthanized a month earlier, but I selfishly tortured her with my attempts to turn back the hands of time and keep her around. My regrets hung in the air as we paid our final respects. My regrets, and the unspoken understanding that Gideon would probably someday have to pay his final respects to ME (hopefully not on an occasion that conflicted with Black Friday shopping). Fast forward to Father's Day 2012. It's supposed to be a time for hand-wringing and moaning, "They grow up so FAST — and select neckties even faster!" (after all, Gideon's toddlerhood is now a blur, he's half old enough for a driver's license and one-third old enough for a master's degree); but I think the Mewsilla incident has taught me to take life with my little strawberry blonde one day at a time and cheerfully accept each new milestone. There will be plenty of time later to deal with his first fender bender, his first broken heart, his first pink slip and the pangs of empty nest syndrome. Right now I try not to become TOO exasperated with a boisterous extrovert who babbles his life story to total strangers, delivers a complimentary body slam with each hug, thinks an "indoor voice" means "indoors at the Metropolitan Opera" and assumes you're respecting personal boundaries as long as you stop just short of an impromptu colonoscopy.